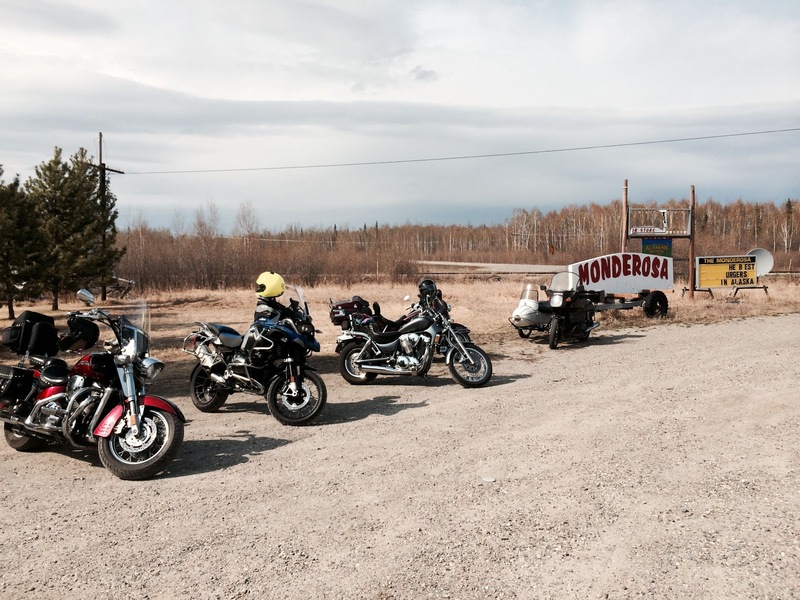 As I had mentioned before, there are very few places in Fairbanks that motorcyclists like to ride. The Monderosa is one of these places. The loosely, non-organized BMW riders group went there yesterday for lunch and today, riders from our church rode out. As you can see, it was a mix of bikes with the majority being cruisers. The assistant pastor did have his new R1200GSW which he says is as nice as he had read about. He has an ADV bike rental business and this is the newest addition to his rental fleet. Another "first", Bridget joined the group and rode in the sidecar. This is the longest trip we've taken together with the bike. Since the bike was set up for no passenger in the sidecar, it pulled to the right and with no steering mods, I got a pretty good upper body workout on the trip. She indicated that it was a little bumpy and kind of cold. The weather wasn't quite as nice as yesterday (61°F and partly cloudy) and the rain just caught us for the last mile. There were a lot of cross-winds trying to blow us around. I set the GoPro to take a photo every 5 seconds and used the GoPro Studio software to put the photos together into a video. The 55 minute trip is reduced to a 22 sec video. I can imagine the workout you said you got. It's what I assumed you were doing quite a bit with winds and rough roads before you said it wasn't a problem when empty. Whew. If you ever take the sidecar off you will feel like you are flying! 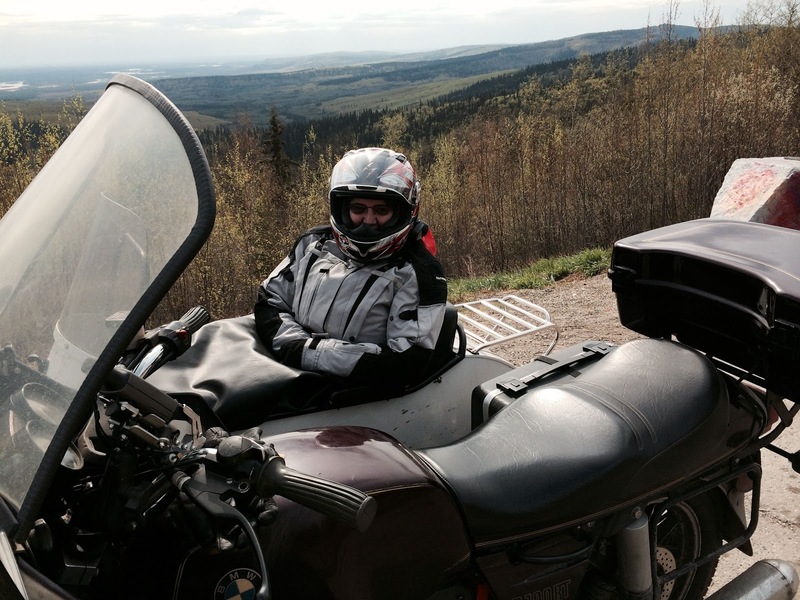 Nice photo of Bridget- and good for her enjoying the adventure! The pull to the right means that constant force needs to be applied to the bars to keep going straight and turning left at highway speeds takes quite a bit of effort. This could be remediated with a different steering setup but I figure that I could use the exercise. lucky you aren't stopping a lot either. I've seen electrically adjustable lean which raises and lowers the sidecar wheel. This could be used to compensate for additional sidecar weight or the crown of the road. the geometry of the sidecar connections articulate according the the bike angle. Thanks for the link. I have no interest in a leaner as it doesn't do anything for stability in the snow. It's designed for riders who still want to lean into corners and given all of the complexity, I'm not sure if there is sufficient benefit. But that's for me. So with the upper body workout does that mean you're taking a passenger with you more often for exercise? I enjoyed the video, it was like it was on fast forward. Forgot to mention that I liked the video too. The problem I have is that I have to reduce all the photos and then they don't put themselves in correct numerical order when I drag them onto the timeline. Last time it was a nightmare for me, to manually move them in sequence. That's why I don't do timelapse. But I do like the idea of it. I think it's whenever the passenger feels like tolerating the sidecar. I hear it was a cold and bumpy ride. As far as the video, I didn't have to do anything with the individual files. The GoPro software just imported the folder(s) of pictures and put them into the timeline. They even had a section in the documentation on doing timelapse videos. A good upper body workout is a good thing. The only resting opportunity is when the road turns to the right and you can let off pressure on the bars.